Hi everyone! JMD Reid here! Every Saturday, I’m going to post one of my short stories for you all to enjoy! It’ll be up on my blog for a week before it gets taken down and a new story replaces it! Rehman leaned against the statue of the great heroine Xella, wineskin in hand. He took a deep swig, the wine cheap and sour, but he was drunk enough not to care. The world was ending. Heljina’s song had quieted. The ground shook as Zarketh stirred, so the quality of his wine hardly mattered at all. A silent breeze—even drunk, it was strange not to hear the Goddess’s beautiful harmony upon the wind—ruffled his sky-blue acolyte robes. He took another long drink. Despite the fact that the world was about to end, it was like a festival on the temple grounds. All the temples were bedecked in their finery, from Heljina’s own, painted blue like the sky, to the temples dedicated to her daughter and son, Golden Felikia and Silver Bedko, and all the lesser shrines in between. All of the activity was centered round the Kurokin Stone. Every would-be hero and braggart for miles around had come to draw Bedko’s Blade from the sky-blue rock—to throw his or her life away to save the world. Rehman and his fellow acolytes had watched, and mocked, oaf after muscle-bound oaf heave and strain and groan until, cursing, they’d stumbled away, faces dripping with sweat. After the third wineskin, Rehman and his fellow acolytes found the absurdity hilarious. He wasn’t too concerned about the world ending. Five hundred years ago, Heljina’s Song to her slumbering husband had also stilled. The brave Xella, whose statue he so unceremoniously leaned against, had drawn the first sword from the Kurokin, entered the Tomb, and never returned. The world hadn’t ended, so she must have accomplished something. And if one of these moon-drunk idiots pulled the sword, Rehman was confident they’d do the same. “Look at that one,” Dorrim laughed, taking the wineskin and pointing at the Kurokin stone. At the stone. a burly man, perhaps a blacksmith’s apprentice, grunted like a rutting bull as he struggled to pull the silvered blade from the heart of the blue stone. The man’s face grew a bright red, his forearm muscles bulging, but the sword refused to yield. “Doesn’t he know only the promised one can pull the sword?” weaselly-faced Vellin chortled. “His muscles have squeezed out all his brains,” Rehman joked. The apprentice blacksmith heaved and strained with all his might to rip the sword out. So great was his effort, that when his hands slipped from the silver grip of the sword, he fell back, landing like a sack of his turnips on his backside. Perhaps if Rehman had been just a little more sober, he would not have laughed so hard, but he was now on his fifth wineskin and his head swam with drink. A shadow fell across Rehman as he grasped his knees, his sides aching with laughter. Dorrim gave him a sharp nudge in the ribs. He looked up; the apprentice towered over him. The hulking youth flung Rehman forward. He fell, hands braced before him, against the hard surface of the Kurokin. The blue boulder, the size of a large carriage, was warm beneath his touch. It pulsed with a slow, steady rhythm. The Goddess’s hand had plunged most of the blade into the stone, leaving only the silver hilt and quillons—which swept downwards, forming a crescent guard—exposed. Rehman swallowed, eyeing scarred knuckles. Then he gripped the sword in determined hands and heaved with all his rather unimpressive might. He fell backwards, just like the blacksmith apprentice had. The ground smacked him in the back, driving the air from his lungs in a painful gasp. He lay stunned, barely aware of something gripped in his hand. A hush fell across the crowd. Rehman stared in confusion at the apprentice’s paling face. Rehman sat up on his elbows, surveying the crowd through bleary vision. Men, women, and children gaped at him. Why’s everyone looking at me? he wondered. He raised his right arm to rub at his sore back when he realized what he held. By Heljina’s Song, I drew it. He held the silver blade in his hand, the edge rippling like gentle waves. Disbelief punched his gut. This can’t be happening. His thoughts whirled. The world spun around him. I can’t be the one chosen to defeat Zarketh. I’m just an acolyte. Rehman gazed up at the statue of Xella, the maiden who’d drawn the golden sword five hundred years ago. The heroine was last seen walking into the Tomb to drive Zarketh back into his slumber. She stood proud, holding the golden sword, Felikia’s Blade, up high, her youthful face full of confident determination. She’d been a warrior, trained from birth in the arts of the sword. I can’t even hold a broom right. How can I defeat the Lord of Earthquakes and save mankind? Rehman fainted, the rippled blade still clutched in his hand. Xella pushed through the men standing defeated around the Kurokin, her leather boots squishing upon the grass trampled into mud. The blue stone rested in an empty field near the rude village that the laborers dwelled in. There were grand plans to build a temple to the Sky Goddess near the holy Kurokin. She didn’t care about any of that. As her father had always predicted, the world was ending, and someone needed to save it. None of the laborers or the men of her tribe had succeeded in drawing forth either of the swords. Now, they could no longer deny her the chance. “Get back to your sheep, girl,” spat a leathery-faced man, three of his front teeth missing. She ignored him. She was used to being shunned. They’d proclaimed her father a blasphemer, and his supposed sins against Heljina stained her, too. She reached the sky-blue stone, the warmth of the Kurokin taking the chill out of the autumn night. Two swords were thrust into the stone—one gold and one silver. With malice and hatred shall Zarketh awaken. Two shall be chosen, separated by time. Through death shall history transcend. No longer did sweet melodies whisper on the wind. Instead, the ground rumbled beneath their feet. Zarketh stirred. Xella stopped before the large boulder, the Holy Tear shed by the Sky Goddess. Xella grasped the gold sword, Felikia’s Blade, and drew it forth with ease. The blade was long, both edges serrated with upturned teeth, as if the blade had been a single tongue of flame frozen in steel. The hilt was ornate, gold, a sunburst worked into the quillons. She surveyed at the crowd—the men who’d hounded her father to suicide and her mother to starvation. “I’ll save you anyways,” she whispered, gall burning the back of her throat. Her journey to the Tomb took the rest of the night; no one followed her—they were all full of shame and cowardice. Clear skies allowed Bedko to light the grassy hills with his silver countenance. The ground’s trembling grew more frequent as she crossed the grassland in her sheepskin trousers. She lived on the plains, herding her sheep with her dog, Usti. She’d left him with the flock. Someone will claim Usti and my sheep if I don’t come back. They’ll be taken care of. Her feet strode across the plain with the confidence her heart lacked. She could walk these fields blindfolded. She knew the terrain intimately. She knew to never travel in this direction. A single, dead hill rose up at the center of a valley, a boil upon the earth. Nothing grew on the mound. The grassy plain ended at the base of the hill—the tomb of a slumbering god. When humans were created, Zarketh had grown jealous of the attention his wife, the Sky Goddess, had lavished upon them. He’d caused the ground to quake, toppling mountains to bury men and opening chasms to swallow them up. So Heljina had begun her Song, singing on the winds and keeping him asleep until two champions would arise, separated by centuries, to defeat him. That part never made sense to Xella. The hill’s earth was cold and clammy, staining her hands black whenever she slipped and had to catch herself. Behind her, Felikia brightened the horizon with the new day’s birth. The dark soil seemed to drink in the morning light, darkening instead of brightening. She reached the summit of the dead hill, a single spire of black stone thrust upward at its crown. An uneven opening had been cut into the spike, large enough for three men to walk abreast. A cold, stale air burst out of the hole in successive gusts. Fear gripped her. She looked behind her, almost blinded by the rising sun. A figure stood at the edge of the hill, almost lost in the bright sunlight. Her heart beat faster. She raised her hands to shield her eyes and see who’d followed her. No one. Just a trick of the light. She was always alone. Xella faced death’s entrance and swallowed her fear. She surrendered to the chains of obligations pulling her into the darkness. Rehman was breathing hard when he reached the summit of the dead hill, all his friends and family waiting for him. Everyone wanted to accompany him. He was the hero. He’d drawn the Sword of the Moon, Bedko’s Blade. Every girl he knew had kissed him for luck and every man had shaken his hand. He desperately wished that anyone else had drawn the blade. “I’ll just mess it up,” he’d complained to his mother. Everyone thinks I’m going to die. And why not? The great warrior Xella failed to return. What chance do I have? “None,” he muttered as everyone watched him walk towards the uneven hole carved into the upthrust spire—the Tomb of the Sleeping God. He wanted to run, wanted to throw the silvery sword away. He couldn’t. He had to save the world. Everyone’s expectations were chains about him, dragging him to the Tomb. His fear rooted him to the earth, trying to fight the pull towards the dark hole. The sun set behind the spire. Dying. Dead. Darkness fell. Did Xella feel this same fear? Did she know she was going to walk into this hole and never return? He pictured her standing at the entrance. A tall, slim girl, the Sword of the Sun held in her hand. He could almost see her peering into the dark portal, her black hair tied back with ragged strip of wool, form dressed in rugged leathers. She turned back, taking one last look at the world she was about to leave. He almost laughed; his imagination of her was plainer than her statue, not as graceful or beautiful, and certainly not as curvy. Just an average girl. “What are you waiting for?” whispered Dorrim. The image of Xella vanished. Swallowing, the sword gripped in his hand, Rehman took a single step towards the opening. Everyone stared at him, full of hope. He was supposed to save them. Rehman wanted to laugh. I can’t even sweep the temple right. The chains pulled; another step. A third step. All those eyes staring at him, ratcheting the chain tighter and pulling him towards the darkness. I have to die so everyone can live. My parents, my little sister, Dorrim and Vellin, my cousins, and aunts and uncles. The entirety of mankind depends on me. The portal loomed larger as if it had yawned open to swallow him. Cold air wafted out of the dark opening in short gusts that rustled his coat. It came in regular intervals, like something was . . . breathing. Rehman swallowed. The exhalations of a god washed over him. He trembled, his stomach twisting into knots like ropes of sausages. He closed his eyes and stepped into darkness. Everything went silent—the cheers of his friends and family, the beating of his heart. Deathly silent. He opened his eyes; the sword glowed silver, illuminating a tunnel that spiraled down into shadows. The rocks were dark, damp, and Zarketh’s breath washed over him. Rehman looked back. There was a solid wall of sheer, inky darkness. No choice. He went down. The tunnel seemed to spiral downward for eternity. Nothing changed. Always the same, uneven ground; jagged walls dripped with filth; spikes, like sharp teeth, hung down from the ceiling. He walked down a never-ending gullet, swallowed by Zarketh. When he grew thirsty, he drank from his waterskin. He had six of the heavy bladders in his pack, along with several days’ worth of tough, dried, and very salty jerky. When he tired, he slept, and felt even more exhausted and sore when he woke up. His pack grew lighter. He discarded waterskin after waterskin, his food devoured. He kept walking. Am I dead? A corpse shuffling downward forever? The aches of his body faded, his throat grew less parched, and his stomach ceased to rumble. The sword didn’t answer. It never did. It just shined its pale, silver light. When he rested, Rehman would stare at his reflection in the wavy blade. His eyes were sunken, his fat face had grown hollow, and his lips had become cracked lines. He froze. The tunnel opened up. He’d finally reached the bottom. Something lay grimy white on the ground. “What do we have here?” he asked Bedko’s blade, cocking his head in curiosity. Before the journey down, this skull would have bothered him. Now it was something different from slimy rocks. It was novel. The jaws were fused together and its snout was elongated, sweeping out into a crescent blade—an axehead. Xella blinked; something different lay ahead. For days, she’d descended the tunnel, her body slowly growing leaner, more gaunt. She hardly recognized the pale face reflected in the flame-like blade of the Sword of the Sun. Her black hair was a tangled, grimy mess from the moist dirt caking the walls, and her cheeks were sunken hollows. And the loneliness . . . She thought she knew isolation. She didn’t even have her flock or Usti for company. And though she’d been shunned by her tribe, they were something. But this endless walk down into the grave taught her the true meaning of solitude: hopelessness. But finally, there was something new and different. The tunnel leveled and opened wide. She moved faster, laughing aloud. She rushed out into the wide room, throwing her arms out and spinning about. She could barely see the spike-filled ceiling above or the walls out to either side. Something scraped in the darkness. She froze. “Is someone there?” she shouted. “. . . s . . . omone . . . the . . .” Her voice echoed back, hollow and faint. “Please, don’t be afraid!” Xella cried out. The scraping grew louder. She whirled, looking for the source. Something moved in the shadows. A beast. Maybe the size of a sheepdog. Usti followed me! she thought with desperate longing. But that didn’t seem right. Hope ignored doubt. It lunged, slashing at her with its axehead mouth. 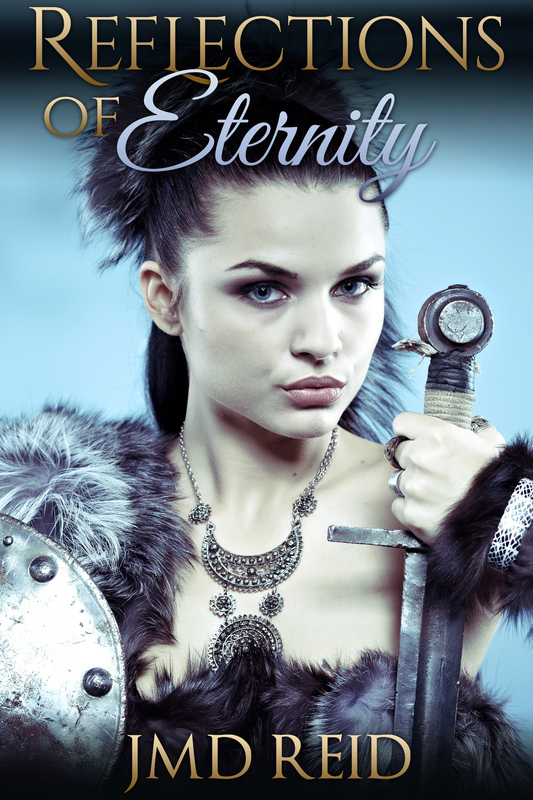 Xella swung her sword, shadows dancing as the glowing weapon arced through the air. Her blade cut the demon’s body. The corpse landed with a rattle, like it was nothing more than a sack of old bones. The head bounced across the floor, before coming to a rest at the tunnel’s entrance. A low, scraping sound came from behind her. Then a second. And a third. Bones lay scattered all over the cave, grimy white with scraps of black, moldy leather clinging like filth. Rehman kicked another axehead skull over with disgust. A clean cut had sheared through the back of the skull. “Xella did this,” Rehman told his sword. He could almost see her, dancing around the cave, her golden blade flashing. The axehead demons must have attacked her from all sides. She was gaunt like him, her long, black hair a tangled, filthy mess swirling behind her. She moved with the grace of a maiden dancing in Felikia’s honor, stepping light, her dirty face so alive. Rehman stood in the cave’s center, entranced by his imagination, turning to follow her as she sprinted, attacked, dodged, and tumbled. Xella swung and sliced through his imagination of the demons—their bodies the size of a large hound, with bony limbs tipped with sharp, curved claws. Half of a corpse landed at Rehman’s feet, right where a pile of bones lay. His imagination was so real, so vivid. His heart beat faster. For the first time in what felt like an eternity, he felt alive. He cheered when her sword felled another demon, and winced when she narrowly avoided a sweeping slice from an axehead. Sweat beaded his forehead. He held his sword up high, waving her on. Three axeheads cornered her. She faced them, her face flushed, red, alive. They leaped. Her golden blade swung, slamming through the first demon’s shoulder. She pivoted, the demon falling into a pile of moldy bones, and dodged the next monster’s leap. “You can do it!” Rehman cheered. She cut the second one down, then dashed across the cave. She passed through Rehman in a flash of warmth. The last demon followed. She spun around and slammed her sword down at the flying beast. Axehead met sword edge. He could almost hear the ring of steel on bone as her sword sheared through the beast. It fell in pieces around her. “She did it, sword!” Drunk exhilaration filled him. It didn’t seem to matter to Rehman that this all was in his head. His hallucination was so real, he thought he could reach out and touch her. Xella relaxed, bending over and grasping her knees as she struggled to catch her breath. She didn’t see the last axehead stalking behind her. “Behind you!” he shouted. She didn’t hear him. She wasn’t real, just his imagination running wild after days, maybe weeks, of mindless boredom. The demon stalked closer and closer; it crouched. Its crescent snout gleamed in the golden light from her sword. He didn’t think. Fear guided him, and he swung his silver blade at the beast. The thing leaped, axehead streaking towards Xella’s unprotected back. Bedko’s Blade bit into leathery flesh, the shock jarring his arm. His stroke passed through the demon, driving its body towards the ground in ragged pieces; they bounced and rolled to a stop at two piles of bones. Xella turned and gaped at the severed body. This can’t be happening. I can’t actually have killed the beast. Those bones have been there for five hundred years. Xella’s dark eyes widened as she saw him. She spoke, but no sound reached his ears. She reached out; longing painted on her face. Her fingers were slim, feminine, filled with a desperate need for contact. Unconsciously, his own hand rose up, their fingers merged, the past reflecting before him as impossible to touch as his image in a pool of water. The grimy man stared at her, reaching out to touch her outstretched fingers. His face was sunken, his skin hung loose, and his filthy clothes hung off his emaciated frame. His hair was short, dark, as tangled as a bird’s nest. He may have been handsome, but it was hard to tell beneath the streaks of dirt. Their reflections came together and. . . She passed through him. He vanished. She collapsed over the corpse the apparition had slain. Isolation crushed her, as oppressive as the weight of all the stone above her, imprisoning her in darkness. Ragged sobs shook her body. After a while, the tears stopped. Hope had died within her. There was nothing left for her to do but walk. Over and over, that thought wormed through is mind. Rehman stumbled on. After the axehead chamber, the tunnel narrowed again. It descended, but not as steeply, curving like the undulations of a serpent. I affected the past. I saved Xella. He drew strength from that thought. It breathed life back into him. “It was my edge that slew the demon,” Rehman answered, using a deeper voice to pretend the sword was speaking. “I swung you,” he retorted back in his normal voice. The tunnel widened abruptly ahead into a vast sea of darkness. It appeared the tunnel ended in nothingness. Rehman approached cautiously, his left hand trailing against the wall and his right clutching Bedko’s silver-glowing blade. It wasn’t the end of the tunnel, merely a cliff. Some great chasm, wider than his light could reach across, had split the tunnel in twain. When he looked down, he saw nothing but the rock’s face disappearing into darkness. “How am I supposed to climb this?” he asked the sword. He studied the cliff face, noting it consisted of the same dark rock as the tunnel, full of crevasses and cracks for purchase, but covered in damp filth. And its depth . . . The bottom could just be out of sight of his light, or could be miles below. Fear beat in his breast. “I can’t do this,” he complained. “What choice do you have?” he pretended the sword asked back. Light blossomed below, golden as the sun. Xella appeared, climbing down this cliff. She was far below, little more than a dark form with a brilliant sword strapped to her back. Hope burned inside Rehman. She had the courage to do it, so why not him? Xella slumped against the cliff’s base, exhausted. Depressed. Forever cursed to be alone. If she still had tears left in her, she would have flooded the Tomb and drowned the sleeping god. But she was dry; a desert of despair filled her. She clutched Felikia’s Blade in her hand, staring at its shining surface. Maybe I’ll just stay here and die . . . Let all those who called Father a blasphemer be damned! They can save their own cursed hides! Silver light bathed her, mixing with her sword’s golden aura. It was soft, rippling like light dancing on the surface of a pond. She looked up. The stranger was just above her head, climbing awkwardly down. He had Bedko’s Blade secured in a makeshift harness. Hope grew inside her. She fought it down, reminding herself that it was just an apparition. An apparition that saved my life. He wavered, rippling, and his light was gone. The silver light burst into existence beside her. The man sat slumped against the cliff wall. He turned and smiled at her, nodding his head. Exhaustion melted from his face as his lips moved, but she heard no sound. “Hello,” she said back, returning his smile. She felt suddenly shy, like it was a festival and she was meeting a new boy from a distant tribe. Her heart drummed in her chest while warmth flushed through her. Xella reached out, knowing he wasn’t real, but needing to see, to feel, for herself. She brushed his shoulder; her finger passed through his reflection, tingling with life. Who was he? Where did he come from? Was he dead? But he has Bedko’s Blade, and I left that sword thrust into the Kurokin. Did he come after me? His clothes were strange, not sheepskin leathers, but fashioned from some other material made with a fine weave. There were curious, round fasteners made of bone holding his clothes together instead of rawhide lacings. Am I seeing tomorrow? Was this soft man the second champion spoken of in the prophecy? The one who would follow after me? But who he was didn’t matter. Only what he meant: she wasn’t alone. Her eyes closed; she was so tired. She leaned her head towards him. Her face tingled. She smiled, knowing his reflection touched hers. He felt rested for the first time since venturing into the Tomb. He sat for a moment, the pulsing breath of the slumbering god washing over him. She’d seen him . . . And he’d seen her. He didn’t understand how the past was reflecting on the present, but it lifted his spirits. She was so strong and capable, and her strength rubbed off on him. He stood up, stretched his sore back, and pressed on. The terrain at the bottom of the cliff was a flat, wide-open forest—well, that’s the best way I can describe it—of rock spikes jutting up from the floor. Rehman wound his way through the spikes, using Zarketh’s breath to navigate. So long as the stale air blew against his face, he had to be drawing closer. As he walked, Xella would flicker into being. Golden light would blossom, sometimes ahead, occasionally behind, but usually to his right or left. They didn’t walk quite the same path, choosing different routes to navigate the “forest.” She wouldn’t appear for long, often mere heartbeats. Long enough for them to meet the other’s gazes, nod their heads, and then she’d flicker away. Every time she appeared, it filled Rehman with new vigor. Xella had survived this oppressive place and succeeded in defeating Zarketh. So could he. The forest of spikes ended at another towering cliff face pierced by a huge, unevenly carved opening lined with spikes. For a moment, Xella appeared at the entrance, golden light painting the opening. He smiled at her; she beckoned him to follow. Seeing Tomorrow, as Xella dubbed the apparition, flicker into existence as she threaded her way through the spikes kept her hopeful. He had a boyish grin plastered on his face every time he saw her, spurring her to keep walking. The spikes ended at a sheer cliff that seemed identical to the one she’d climbed down, except a single, yawning opening pierced this wall. She studied the dark opening for minutes, maybe hours. Xella had come to savor the freedom of the spike valley where the ceiling was so high up it lay out of the reach of her light. She could almost pretend she was walking through a really dark night. That illusion was shattered, now; she trembled at the thought of reentering the oppressive closeness of another tunnel. Silver light blossomed. Tomorrow was back. Strength rushed into her. She wasn’t alone. Xella motioned him to follow and stepped into the tunnel. His light died, but she knew he was following. Maybe not for tens or hundreds of years, but he walked the same, oppressive trail she did. This tunnel spiraled in a tight, steep pattern. She feared another eternity-long descent like the first one. However, in what felt like only an hour, it flattened and widened into a large room. Relief flooded her. Open! The ceiling was well out of reach of her hands. Just like the axehead room. She tensed, scanning the room, straining to hear. Silver light blossomed; Tomorrow manifested. Fear twisted his face. His silver sword was swinging in a clumsy arc. A horrible, multi-legged thing leaped at him. Its body was black, bloated, and covered in thick, spiny hair. The demon almost resembled a spider, but no spider grew to the size of a large dog. And no spider’s legs ended in grasping hands with long, thin fingers. Ichor spurted purple, splashing Tomorrow as his blade cut the thing in half. It fell to the ground, then wavered and vanished. His mouth was wide open. He screamed, terror filling his eyes. He swung his sword in a wide circle, batting a second spider away. More and more appeared around her, crawling on the walls and ceiling, scurrying on the floor. One passed right through her, leaving behind numbing cold. “Watch out!” she shouted, forgetting he couldn’t hear her. He didn’t even notice her. He fought, desperately slicing and thrusting his sword. Every time he killed one, its body vanished. She felt so helpless. She wanted to aid him. One leaped and landed on Tomorrow’s back, slamming him to the ground. The abominations swarmed him. Clutching hands seized him. One grabbed his throat, the fingers so long they wrapped around his entire neck, and squeezed. He saved me! The memory blazed in her mind; the axehead lying dead, slain by him. This has to work! The spider’s clammy hand squeezed the life out of Rehman. His vision grew fuzzy and black. He struggled to escape, but other spiders pinned him to the rough cave floor. Spindly hands grasped his arms, his legs, his torso, and his neck. Their grips were iron manacles, crushing him. I knew I’d fail. Why did the sword pick me? Xella appeared, Felikia’s Blade burning with golden light and arcing swiftly down. It sliced through the demon. Cold ichor spilled across Rehman’s chest. The spider choking him fell dead. She swung again, severing three limbs on another. His sword arm came free. He stabbed and kicked and sliced. With Xella’s aid, he scrambled to his feet. “I can do this!” he shouted, exhilaration flooding into him. Xella was with him. Together, they could defeat them. More came skittering across the ceiling and dropped down at him. Rehman swung, parting a bloated body and raining more stinking, purple ichor on him. Xella danced past him, her glowing sword flashing from the past, killing demons in the present. Nothing moved. He blinked; they were all dead, hacked to pieces. Xella grinned at him, nodding her approval. Then she wavered and vanished. He exhaled, the excitement bleeding off of him. He struggled to wipe the ichor off his face. It tasted foul, bitter, and smelled far worse. The sword didn’t answer. It never did. Past the spider’s lair, the path narrowed, but went straight for a time, until it widened into another huge gallery. Only instead of leading to a cliff, the path skirted along a rock wall, with a huge drop on the right. The path was narrower than his feet were long. He had to press his back against the rock’s face, sliding his feet sideways, his toes dangling over the lip. A bit of rock broke free, tumbling and echoing loudly as it bounced deeper, and deeper, and deeper until the sounds just faded away. He never heard that final, resounding crash of it hitting the bottom. Xella manifested, standing in thin air before him. He blinked as she stopped her leisurely stroll to look at him, a curious expression on her face. How can she float? He looked at her feet. A rocky surface surrounded them, fuzzing into haze after a few fingerswidth. She watched him, shaking her head, a playful smile on her face as he shuffled along. He shuffled. His foot slipped. His stomach lurched as his right hand tried to grip the wall and his left arm pinwheeled. He teetered over the edge, about to fall forever like the rock. Xella caught him and shoved Rehman back. Warmth burst through him. She pressed him up against the wall, her body pulsing against his in a steady, rhythmic beat. A heart’s beat. He panted, staring into her dark eyes. Her lips were so close to his. A sudden desire gripped him. He leaned in to kiss her. Tomorrow was with her more and more often. She could still feel the lingering warmth of his body when she’d pressed against him. She didn’t understand what had happened, but his foot had vanished through the floor, and it had looked like he was about to fall. She’d reacted and . . . touched him. Time had lost any sort of meaning. Did they walk for hours between rests? Or was it days, or weeks, or only minutes? When they grew tired, they would lean against the same wall, just inches and centuries apart. When Xella woke up, he would be watching her, and she couldn’t help smiling winsomely at him. He was always talking, and she wished to hear his voice. She imagined it high-pitched and full of boyish enthusiasm. The tunnel widened into another room, spikes teething the ceiling. Tomorrow was with her, his sword gripped tight in his hand as he scanned the room. She stood at his back, looking the other way. What sort of horrors dwelled here? And when would they attack? Nothing came. They moved cautiously across the room, watching and listening. He moved strangely, like he was stepping over something. Fear tightened her stomach. He must be stepping over the corpses of demons that hadn’t yet died for her. A great, rumbling groan echoed through the room. A strong breath of wind rushed past her. She flinched. Tomorrow didn’t react until he noticed her, then he looked around, bewildered. The groan returned, louder, almost a physical force that rattled her bones. And it rattled the Tomb. Xella was thrown off her feet, the ground writhing beneath her, and landed heavily on her side. Her sword slid away, still glowing, and bounced wildly across the floor. Tomorrow stood in shock, staring at her. He didn’t move. The ground heaved and rippled about his feet, yet he stood unaffected. With a splintering crash, a spike fell from the ceiling. It impacted the ground, bursting into rubble and spraying her face with sharp rocks. “Skies above!” she screamed, and tossed about on the ground. More spikes crashed down. She rolled onto her back, getting caught in a small crevasse. Above her, a stony fang torqued as even the ceiling shook. Her eyes widened in horror. I need to move! Felikia’s flames, I need to move! Tomorrow grabbed her. As he hauled her away, a warmth flushed through her. The spike crashed down where she’d lain a heartbeat ago, leaving behind a mound of rubble. Another violent shake bounced her out of his grip and rolled her across the floor. He followed and yanked her clear of another plummeting fang. It was like he knew where they would fall. Xella slipped out of his hands, bounced by the shaking that he could only witness but not experience. She landed amid the ruins of a spike, her body passing right through the rubble. For her, the spike hadn’t fallen. He lunged, grabbed her, and pulled her clear. Rehman dropped his sword, his other hand seizing her, and he pulled her upright, wrapping his arms around her. She clung to him, her body quaking in his arms as he struggled to hold on to her. She squeezed him tight. Silent screams ripped from her lips. “I won’t let you go!” he shouted, his words echoing through the quiet cave. She peered into his eyes. Some of her fear retreated. She was gone. He stumbled forward; arms wrapped around empty air. Her lips still burned with Tomorrow’s kiss. He’d vanished, but the warmth remained. A giddy, excited energy burst inside her. She’d never been kissed before. Every boy had shunned her when they had learned of her father’s supposed blasphemy. She twirled in the cave, laughing. There was life in this dark, oppressive prison. And it burned with energy. She tripped on a piece of rubble, stumbled, and blinked. The quaking had stopped while they’d kissed. She strode with a bounce to her step to where the Sword of the Sun lay, glowing with its yellow light. Tomorrow appeared at the mouth of the cave. He waited for her, smiling like a pleased boy. She blushed; his eyes . . . appreciated her. She joined him, her hand immediately reaching out to touch him. She passed right through him, leaving behind a pleasant tingle. Disappointment stabbed her. She wanted to touch him again, but she’d settle for just being with him. The quakes grew more frequent. A great snort of wind and a rumble would always precede them. Sometimes it happened to Xella, and sometimes to Tomorrow. Fear would clench her as she watched him stumble and bounce around. She’d try to hold him, to keep him from being crushed by falling spikes or toppling off narrow ledges. When the quaking struck her time, terror gripped Xella. She’d cling to him, letting Tomorrow protect her. She felt helpless as she was tossed about, and protected when he grabbed her and yanked her to safety. They were drawing closer, their histories bleeding together more and more. He was almost never gone and even when the Tomb wasn’t shaking, she could sometimes touch him. She would be walking and her hand would brush his and, for a moment, it would feel solid, real . . . Then she’d pass right through him. A loud wheeze began to suffuse Zarketh’s breathing. They grew ever closer to the god. Whatever she had to do, she was glad Tomorrow was with her. They kept trudging deeper into death. Sometimes, she wondered if she hadn’t actually died the moment she’d stepped into the Tomb. It must have been weeks since she’d eaten or drank anything. Other demons attacked. Slithering serpents with two heads and no eyes; large insects with thick shells and pincered hands that scurried sideways; furry beasts that walked on their arms and attacked with short, nimble legs. A cavalcade of nightmares. The path ended at an inky wall of darkness. The sleeping god’s breath rushed past Rehman like a stiff breeze, rustling his clothing and grimy hair. He rubbed his chin. Frowning, he noticed that his face was bare. He should have had a full beard, but not even a whisker had sprouted. Time didn’t matter down here. “Well, this is it, Xella,” he whispered. He jumped, staring at her, wondering if his ears had deceived him. “I guess I’ve caught up to tomorrow,” she smiled. He nodded; his mind went blank and his mouth felt dry. She laughed. It was rich, sweet, and did not belong in the Tomb. A shivering quake ran through the ground. They both stumbled, catching a hold of each other. The pulsing warmth was gone, replaced by the feel of actual flesh, stringy muscles, and hard bones. The shaking stopped. Maybe Zarketh only rolled over. He hesitated. How can I tell her the truth? Neither of us are leaving. Love. Rehman wondered if he loved her. She’d come to mean everything to him, but what else did he have to cling to in this Tomb? She smiled at him; that made his heart beat faster. She leaned in and gave him a simple kiss on the lips. “It’s time,” she whispered; the heat of her lips lingering on his. He nodded, facing the darkness. They would have to pass through it. He could do it; Xella was with him. She took his hand, so alive, and they stepped into darkness and death. Cold plunged through Xella. The only warmth was Rehman’s hand clutching hers. Light exploded, gold and silver, pushing back the darkness and the cold. Their swords shone so bright, almost blinding. Hers with all the fierceness of the sun, his with all the gentleness of the moon. Rehman squeezed her hand. Their light formed a bubble against the darkness that pressed against them from all sides. Every time Zarketh exhaled, his breath slammed against their light, trying to snuff them out. Xella held her blade up, willing it to shine brighter. She finally had someone, and she would fight to be with Rehman for as long as possible. Maybe they would die down here, but she wanted to savor every heartbeat of his presence she could. She poured her emotions into the sword: the joy of his companionship, the hope for the world above, and the love she’d discovered in the darkest pits. “I am the world’s love!” she shouted at Zarketh’s oppression. “The world’s hope!” Rehman roared. Their light exploded out, banishing the sea of ink. It withdrew like a receding flood, leaving behind slimy, black rocks and spikes jutting across the broken ground. They stood in a wide cavern. Zarketh’s breath washed over them, and the ground shook with a rhythmic pounding, a pulse vibrating through her bones. Xella did not have the words to describe it. A black light pulsed ahead in time to the vibrations rippling through the ground. It was the darkest, blackest thing she’d ever seen. And yet it shone with some sort of . . . unlight. Her mind grappled with it, twisting about as she struggled to comprehend it. She was like a blind person being described the color blue. This dark light was beyond her imagination. The word groaned through the ground. She didn’t so much as hear the single word as feel it vibrating through her bones. A deep, black malevolence filled the grating vibration, chilling Xella’s blood. A god spoke to her. Demons skittered out of holes in the ground, loped past spikes, or crawled across the ceiling. Axeheads, spiders, two-headed snakes. All the demons they’d fought. All the deformed and twisted mockeries of the life who dwelled free beneath the skies. They ran to the pulsing, unlight, blades slashing and felling any abhorrent demons that threw themselves into their path. The cavern quaked, spikes dropped from the ceiling, cracks split across the cavern’s floor. They scrambled, leaped, stumbled, and kept running. The unlight grew brighter as they neared. A massive, stone heart beat upon the cavern floor, grinding as it contracted and expelled the god’s breath. The beating stone was manacled to the ground by slimy ligaments of rotting, dead flesh. Pity stirred in Xella’s heart. Zarketh was trapped beneath the rocks, buried in this tomb. All that weight of all that earth above crushing down, oppressing him. Imprisoning him. He hates us because we’re free. Humans roam beneath the sky. Beneath his wife. Xella and Rehman reached the beating rock, the heart of a dying god. Demons raced towards them, mere moments from tearing them limb from limb. She wanted to do something for the suffering god, but what could she do? All she had was a sword and no time to think of anything else, to do anything else. “I’m sorry,” Xella whispered to the suffering god. “But we have no choice.” He had to die. I can’t let those ungrateful bastards be destroyed. Together they raised their swords and stabbed. The demons raced in from every direction. Rehman raised the Sword of the Moon as Xella raised the Sword of the Sun, tips pointing down at the beating, black rock. This is how we die. Saving the world. He stabbed. His sword sank into the stone as if it was water. Light exploded around him: silver, gold, black. He reached for Xella, grasped her hand as the world folded. Everything became . . . more. Geometries Rehman did not even have the words to begin to describe filled his universe. Things bent, folded, or twisted into impossible shapes. He felt stretched, compressed, inflated. Everything merged, becoming a single point of existence, and yet everything also expanded, filling every fingerwidth of creation. They were everywhere and nowhere. Then Rehman bounced back into being, stumbling and falling onto his backside amid soft, wonderful, and so very alive grass. It was dark, a soft twilight bathing the world with a blue glow. Xella laughed beside him, stretched out on her back, luxuriating in the fragrant grass. Above, a black disk hung in the sky, ringed by blue fire. “What is that?” Xella whispered. Daylight exploded as the moon and sun separated. Before them lay Zarketh’s beating heart. Rehman’s eyes widened. No, it was the Kurokin with both blades embedded into it. He stood up, looking around carefully. Everything looked . . . familiar. The land had almost the same general features of the temple grounds, only more pronounced, unaffected by human will. There was the rise that Bedko’s temple would one day sit upon, and there was the slope that would lead down to the market and his parent’s dry goods store. The wind gusted. Heljina’s beautiful song chorused on the breeze, filling Rehman up with its perfect harmony. Xella laughed and stood facing the wind, letting it blow her grimy, bedraggled hair. “Heljina! The Kurokin is Zarketh’s heart. We didn’t kill the god, we set him free!” Her smile almost glowed. It was infectious. Rehman walked to the holy stone, staring at it. In his mind, he pictured it beating furiously, swelling here, contracting there. He touched it, and felt the blue stone’s warmth and its rhythm of gentle pulses—a god at peace. He and Xella had traveled into the past, stopping Zarketh before his depression could doom the world in the future. One day, maybe five hundred years from now, Xella would draw her sword and then he’d draw his, and they’d do it all over again. And again. His brain hurt just thinking about it. Xella threw her arms around him and kissed him. That helped to stop his mind from aching. “What do we do now?” he asked her after their lips parted. He enjoyed the feel of her warmth in his arms, her life. If you want to stay informed on my writing, sign up for my newsletter! If you enjoyed this story and like to support my writing, you can leave a review or buy Reflections of Eternity from Amazon, Amazon UK, Amazon Canada, Amazon Australia, Amazon Germany, Amazon Japan, Amazon Italy, Amazon Spain, Amazon France, Amazon Netherlands, Amazon India, Amazon Brazil, Barnes and Noble, iTunes, Kobo, and Smashword! The Assassin Remorse takes place in my Jewel Machine Universe!